Here are some more great pictures of the engine going in Jeremy Turner's (Maple Hill Restoration) '65 Mustang Convertible. I just love looking at these. It's cool to see a 200 cubic inch six detailed like this when you usually just see the V-8's. 1965 Mustang 200 Six Cylinder Engine with air conditioning. 1965 Mustang 200 Six Cylinder Engine. Check out the correct engineering part number on the motor mount...nice! 1965 Mustang 200 Six Cylinder Engine. How about this cool NOS alternator belt? 1965 Mustang 200 Six Cylinder Engine. This is a close up of the FoMoCo stamping in the oil pan. 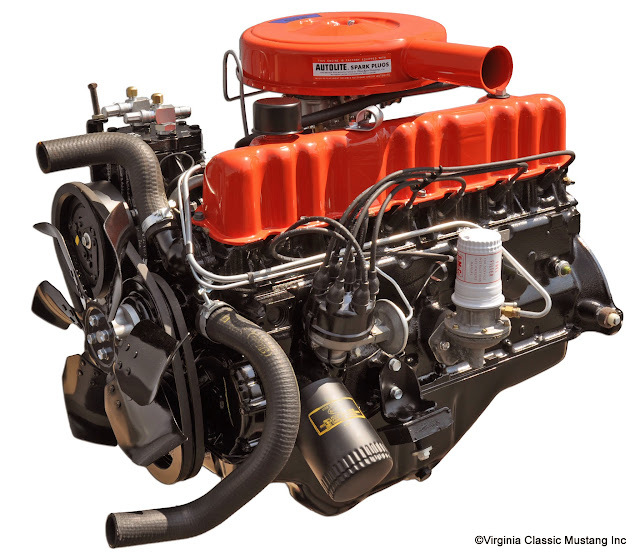 The 1965 Mustang 200 Six Cylinder Engine's air conditioning compressor. 1965 Mustang 200 Six Cylinder Engine engine assembly date stamping. It's difficult to see, but it's "4M29A" for December 29, 1964. 1965 Mustang 200 Six Cylinder Engine's ignition coil detail. 1965 Mustang 200 Six Cylinder Engine. Here's a close up of the December 22nd date stamping on the oil pan...pretty cool! WOW! We just visited Jeremy Turner at Maple Hill Restorations to check out the engine that he is finishing up for his 1965 Mustang Convertible. It's absolutely beautiful! Check out a few quick pictures here. It's all we have time for today, but check back Friday for more. Later next week, we will have pictures of it installed in the Mustang and running! 1967 Mustang 390 Air Cleaner Assembly with Chrome Lid. 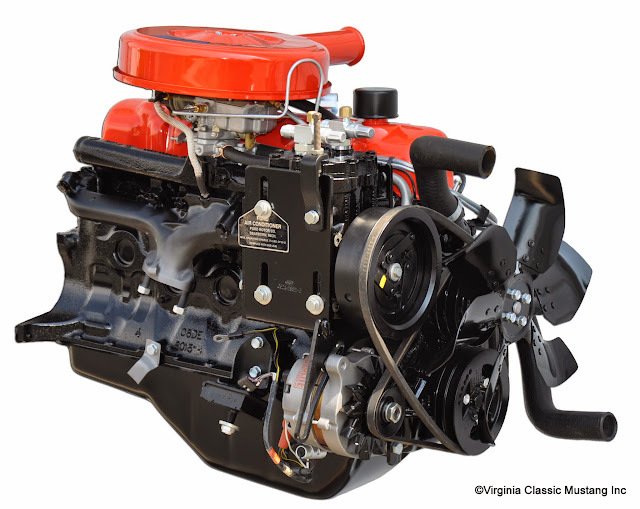 We now have a beautiful reproduction of the 67 Mustang 390 GT Air Cleaner Assembly. This is the style without the emissions control tube. 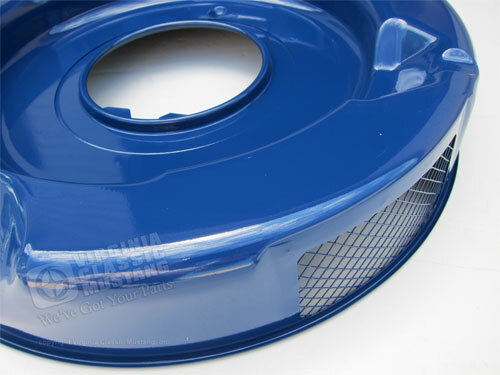 This Air Cleaner is an exact copy made from the original Ford Tooling. 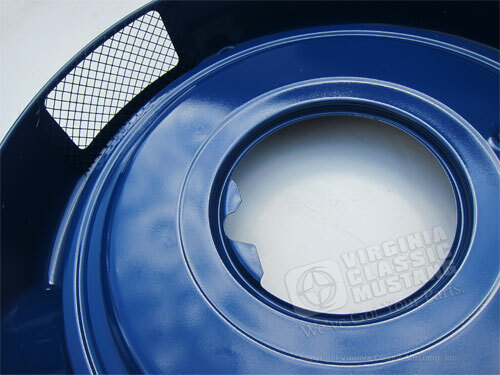 It includes the correct base in the correct Ford Blue color and a beautifully chromed lid with the proper rubber seal. While this air cleaner assembly is correct for the 67 390 and some early production 68 390 Mustangs, it is a fantastic stock appearing upgrade for the very restrictive 68-70 390 and 428 air cleaner assembly. Our part number is EG-4971. Click on the part number link or one of the pictures for the price and/or to order. We also have the lid only - part number EG-4972. 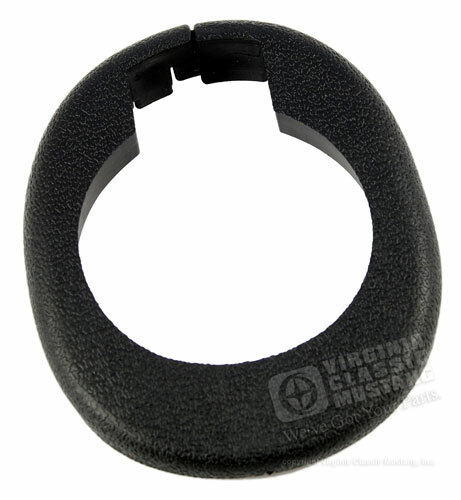 1969 and 1970 Mustang Windshield Rubber Stops. 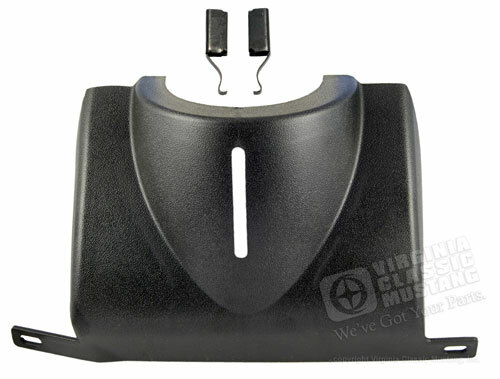 We now have exact reproductions of the original 1969 and 1970 Mustang Windshield Stops. These stops are constructed of stamped steel brackets with rubber "stop" ends. Each one is attached with two screws which are included. These stops are used at the bottom of the windshield to properly align and hold the windshield in place during installation. They are sold as a set of two. There are two used per car, so one set is all you need for one Mustang. Our part number is PE-8912. Please click on the part number link or one of the pictures for the price and/or to order. 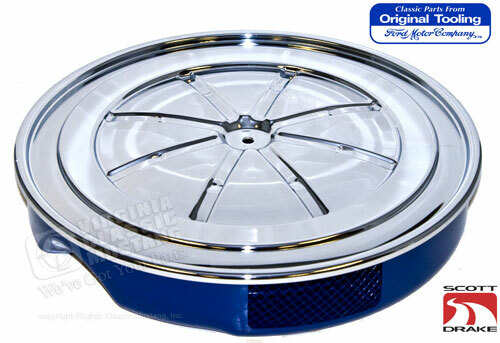 67-70 Mustang Chrome HiPo Air Cleaner Lid. Fits 67 390, Early 68 390, 69-70 428 Cobra Jet and 69-70 Boss 302 without the Shaker option. 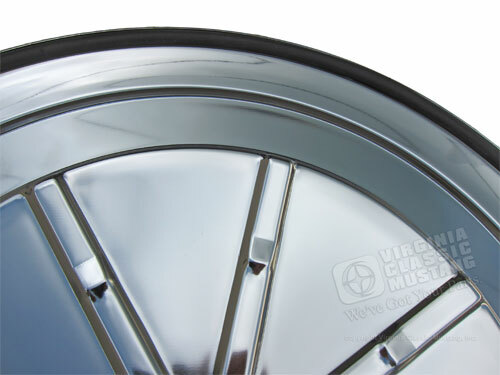 Perfect fit for all of the stock air cleaners with 16.75 inch outside diameter. They will not fit 17 inch air cleaners. They feature nice chrome plating along with the correct rubber seal already installed. Click the part number or either picture to order and/or see the price. Our part number is EG-4972. Underside view showing rubber seal - 67-70 Mustang Chrome HiPo Air Cleaner Lid. Fits 67 390, Early 68 390, 69-70 428 Cobra Jet and 69-70 Boss 302 without the Shaker option. 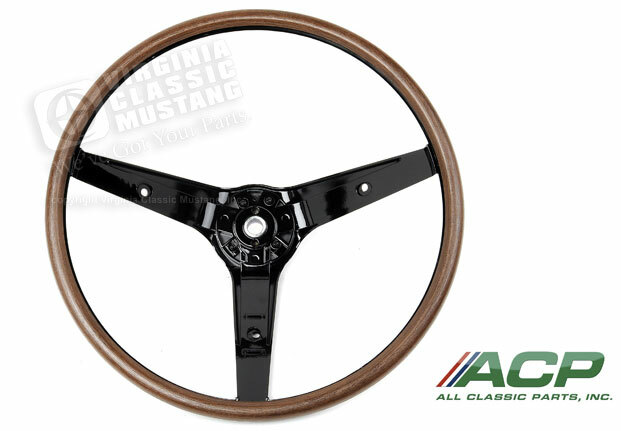 1969 Mustang Deluxe Woodgrain Rim Blow Steering Wheel. 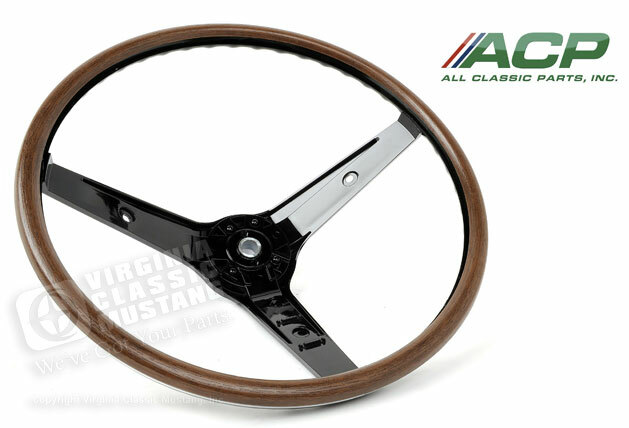 We now have a very nice reproduction of the original '69 Mustang Deluxe Woodgrain Rim Blow Steering Wheel. Most all of these original wheels on Mustangs are worn and cracked. Now your steering wheel can be replaced with a brand new one. Click on one of the images or this part number IN-8833 link to see price and to order. The rim blow horn switch that fits into the steering wheel is not included, but we do have it - our part number is IN-460. 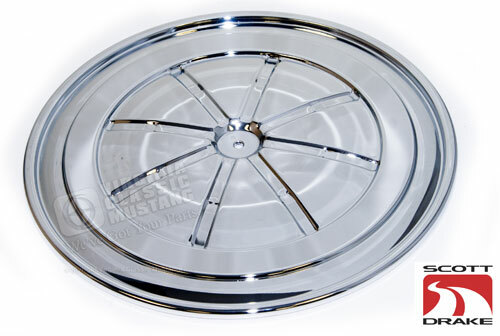 Other related parts that you may need include our IN-8831 1969 Mustang 3 Spoke Steering Wheel Cover Assembly and our IN-8841 Black Pad to go with this. 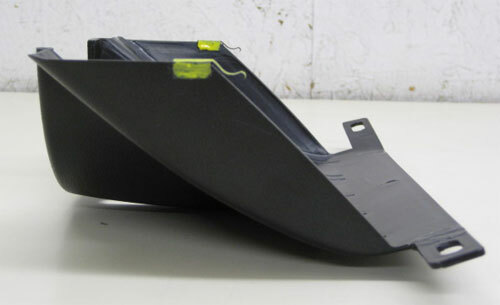 1970 Mustang Lower Steering Column Cover with clips shown painted yellow. 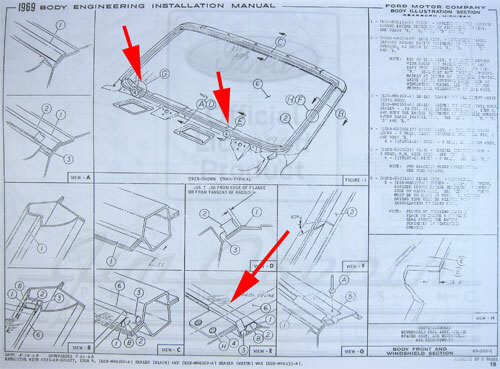 We get a lot of calls about the proper mounting location of the installation clips for the 70 Mustang Lower Steering Column Cover. In the above picture, the clips have been painted yellow to show you where they are mounted. New clips are included with our SU-758 cover. Click on the pictures or the part number link to go to the Virginia Classic Mustang web site to order. 1970 Mustang Lower Steering Column Cover. 1969 Mustang Fastback / Sportsroof Steering Column Grommet. 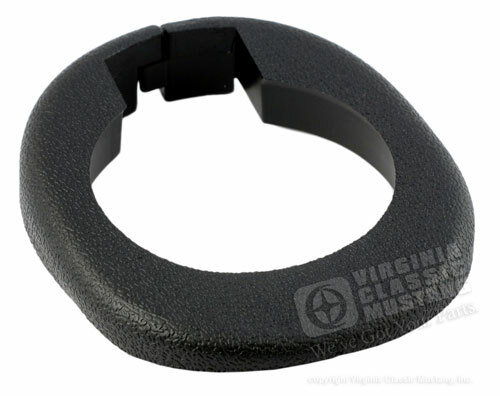 We now have the flexible plastic grommet / trim pieces that go around the steering column in a 1969 Mustang. There are two different styles. 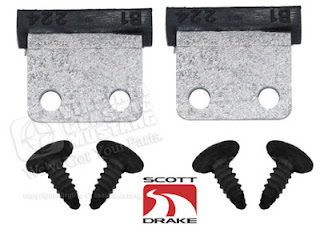 One is for the 69 Mustang Sportsroof (Fastback) and is part number SU-7573. The other has a different shape and fits the 69 Mustang Coupe and Convertible and is part number SU-7572. They both are exact reproductions of the originals and feature the original texture and grain. The part mounts on the lower steering column cover. Click on the above links or the picture to order. 1969 Mustang Coupe and Convertible Steering Column Grommet. 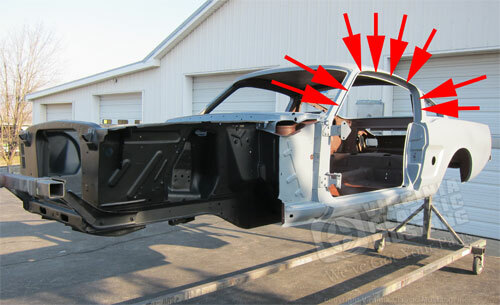 Protecting the "insides" of the 1965 Mustang Convertible. If you been following along with our posts about Maple Hill Restoration's 1965 Mustang Convertible restoration, you are familiar with the great detail and time that has gone into this restoration. As the Mustang continues to go together, we wanted to share one of Jeremy's projects to make the car as maintenance free and last as long as possible. During the restoration, the insides of the panels and frame rails were extensively cleaned. In order to protect these areas, a rustproofing substance was used. The product used was Transtar 4423 Amber Rustproofing. As you can see in the pictures, this product is sold in an aerosol can. This product was chosen because it flows quite well into cracks and crevices, and then it dries to a waxy finish. You will notice that some extra, hidden holes were made to apply the product. Again, I want to note that all of these areas were previously cleaned during the restoration. For example, the inner rockers on the convertible were glassbeaded on the insides by gaining access by cutting the end "caps" off. After cleaning, these "caps" were welded and finished. Here's another new item for your Mustang that we sure get a lot of requests for. It's the rubber seal that goes between the stainless steel roof rail channel that holds the roof rail weatherstripping and the body of the car. This seal comes in a 12 foot roll which is enough to do both sides of your car. 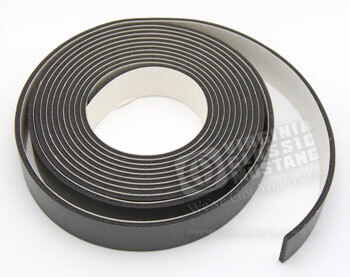 It is used on all 1965-73 Coupe and Fastback Mustangs. This seal has a peel and stick adhesive backing and is easy to install. Our part number is WS-251.